Earl Grey tea is a tea blend with a distinctive flavor and aroma derived from oil extracted from the rind of the bergamot orange, a fragrant citrus fruit, added to black tea. The tea is assumed to be named after the 2nd Earl Grey. Legend has it that the tea, or at least the recipe, were a gift from a grateful Chinese nobleman to the British earl. The tea is known as a "scented" tea, and its taste and aroma evoke the scent of perfume more than a beverage. When this distinctive aroma is coupled with the story of how it came to be named, Earl Grey tea is a distinctive example of the creativity of human beings in combining the bounty of nature to produce a novel item for consumption and pleasure. Earl Grey tea is a tea blend that includes oil extracted from the rind of the bergamot orange, a fragrant citrus fruit that imparts a distinctive flavor and aroma to the black tea. Bergamot orange (Citrus bergamia) is a small citrus tree which blossoms during the winter; likely a hybrid of Citrus limetta and Citrus aurantium. It is grown commercially in Calabria, Italy. Earl Grey tea is made by several companies, although the English tea company Twinings is generally credited with inventing it. Traditionally it is made with both Indian and Chinese teas blended together with bergamot oil. African black tea may also be used, as well as synthetic bergamot rather than the natural oil. The tea should be brewed in 100 °C (212 °F) water for four to five minutes to produce the best flavor. The resulting tea is reddish to dark brown, depending on the blend. The taste of the tea is identical to its aroma, a sweet citrus aroma that is evocative of perfume rather than a beverage, with an pleasant astringent finish from the black tea. It is a classic "scented" tea. For those who prefer a less "scented" flavor, additional black tea may be added. The Earl Grey blend, or 'Earl Grey's Mixture' is assumed to be named after the 2nd Earl Grey, British Prime Minister in the 1830s. The story reflects a moment of friendship between the British and Chinese during the period of the Opium Wars, a time of disputes and hostilities. According to legend, he received a gift of tea flavored with bergamot oil from a grateful Chinese official. The story tells how during a diplomatic mission to China one of the British party had saved the life of a Chinese official; another version claims it was the Earl himself who saved the mandarin; yet another version merely involves a successful diplomatic visit to China. In some cases, the Earl was given a gift of tea, in others only the recipe. Apparently, the Earl enjoyed the tea and had more of it made in England, and eventually the tea was made available to the public. However, these legends of a Chinese official bringing tea flavored with bergamot to Earl Grey are only apocryphal, and not likely to be true. Lord Grey never set foot in China and the use of bergamot oil to scent tea was then unknown in China. Nevertheless, Twinings obtained the endorsement of Richard, the sixth Earl Grey (born 1939), and his signature appears on their packages of Earl Grey tea. It is known that tea flavored with bergamot to imitate the more expensive types of Chinese tea, such as the green tea Fo Shou from Fujian Province and black Keemun (or Qimen), was known in England at least since the 1820s. These teas have a taste reminiscent of the bergamot orange used in perfumery, although they do not contain any added flavoring. Some English tea dealers added bergamot flavoring to ordinary tea and sold them at a higher price. There is a record of court proceedings against Brocksop & Co. who were found to have supplied tea "artificially scented, and, drugged with bergamot in this country." According to the Grey family, the tea was specially blended by a Chinese mandarin for Lord Grey, to suit the water at Howick Hall, the family seat in Northumberland, using bergamot in particular to offset the preponderance of lime in the local water. Lady Grey used it to entertain in London as a political hostess, and it proved so popular that she was asked if it could be sold to others. They did not register the name or formula for the tea, however, which has led to competing companies claiming to have the original formula. There are dozens of variants of Earl Grey tea, including lavender, green, and floral. A particularly popular variant is known as Lady Grey, named after Mary Elizabeth Grey, the wife of Charles Grey, 2nd Earl Grey. It contains lemon and Seville orange in addition to bergamot, producing a more subtle flavor. The Twinings blend contains black teas, Seville orange, lemon, bergamot, and cornflower. Other variations may include lavender instead of or in addition to the Seville oranges. Other variations of Earl Grey tea may include such ingredients as jasmine, as well as other flowers. A blend with added rose petals is known as French Earl Grey. A variety called Russian Earl Grey often contains ingredients such as citrus peels and lemon grass in addition to the usual black tea and bergamot. For a smoky blend, a little Lapsang Souchong tea may be added. There are different varieties of Lady Grey tea; the two most common kinds (Lavender Lady Grey and Citrus Lady Grey), which combine Earl Grey tea with lavender and Seville oranges, respectively. 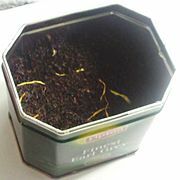 Several companies make a tea called Earl Grey Green, combining green tea leaves rather than the traditional black tea leaves with bergamot flavoring. Rooibos Earl Grey is a variation using this South African tisane as a substitute for the conventional form made with black tea. It is a caffeine-free alternative for Earl Grey lovers. In addition to being drunk as a hot beverage, Earl Grey tea can be used to flavor a wide variety of recipes. It is used as a flavoring for many types of cakes and confectionery, such as chocolates, as well as savory sauces. For sauces, the flavor is normally created by adding tea bags to the basic stock, boiling for a few minutes and then discarding the bags. For sweet recipes, loose tea is often added to melted butter or hot cream and strained after the flavor is infused. There are many health benefits from the oil of bergamot. Bergamot is a disinfectant and an anti-depressant. It is known for treating fevers, intestinal worms, and controlling anxiety. Bergamot also contains esters and alcohol in small amounts which may assist in sleep, although the caffeine in the black tea may counteract this effect. Bergamot, and hence Earl Grey tea, contains chemicals called citrus polyphenols that appear to block the production of blood fats, boost metabolism, and prevent cholesterol absorption. Although the effect has been observed in only a small number of people, if confirmed it could help heart patients lose weight and lower cholesterol, as well as protecting against diabetes without using statins, which may have side effects. In several studies, application of high concentrations of some brands of bergamot oil directly to the skin was shown to increase redness after exposure to ultraviolet light. However, this should not apply to ordinary oral consumption of Earl Grey tea. Bergamot is a source of bergamottin which, along with the chemically related compound 6’,7’-dihydroxybergamottin, is known to be responsible for the grapefruit juice effect in which the consumption of the juice affects the metabolism of a variety of pharmaceutical drugs. Bergamot may also block iron absorption, and so persons suffering from anemia should not drink tea with meals. 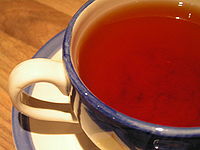 Earl Grey tea appears frequently in popular culture. It is the favorite drink of a variety of fictional characters, including Captain Jean-Luc Picard of the television series Star Trek: The Next Generation, Piglet from Winnie-the-Pooh by A. A. Milne, and Sir Leigh Teabing from the The Da Vinci Code by Dan Brown, among many others. ↑ C.T. Federici, M.L. Roose, and R.W. Scora, RFLP Analysis of the Origin of Citrus Bergamia, Citrus Jambhiri, and Citrus Limonia International Society for Horticultural Science Acta Horticulturae 535(2000):55-64. Retrieved February 15, 2013. ↑ Ben Richardson, Bergamot growers get whiff of success BBC News, April 6, 2006. Retrieved February 12, 2013. ↑ 3.0 3.1 Michael Harney, The Harney & Sons Guide to Tea (New York, NY: The Penguin Press, 2008, ISBN 978-1594201387), 171-172. ↑ 4.0 4.1 Mary Lou Heiss and Robert J. Heiss, The Story of Tea: A Cultural History and Drinking Guide (Berkeley, CA: Ten Speed Press, 2007, ISBN 978-1580087452), 104-105. ↑ Kit Chow and Ione Kramer, All the Tea in China (San Francisco, CA: China Books, 1990, ISBN 0835121941), 180-181. ↑ Earl Grey Twiningsusashop.com. Retrieved February 27, 2013. ↑ 7.0 7.1 Jane Pettigrew and Bruce Richardson, The New Tea Companion: A Guide to Teas throughout the World (Perryville, KY: Benjamin Press, 2008, ISBN 978-0979343179), 65. ↑ Jane Pettigrew, The Tea Companion: A Connoisseur's Guide (Philadelphia, PA: Running Press Book Publishers, 2004, ISBN 0762421509). ↑ Earl Grey tea The Foods of England. Retrieved February 12, 2013. ↑ The Earl Grey Tea House Howick Hall Gardens. Retrieved February 15, 2013. ↑ Micky Fenix, More Than Just A Pot Of Tea Philippine Daily Inquirer, July 24, 2008. Retrieved February 27, 2013. ↑ Chris Cason, Think Outside the Cup: Cooking with Tea TeaMuse March 2004. Retrieved February 27, 2013. ↑ David Joachim, Brilliant Food Tips and Cooking Tricks: 5,000 Ingenious Kitchen Hints, Secrets, Shortcuts, and Solutions (Rodaleyear, 2001, ISBN 978-1579543013). ↑ Tish Boyle, The Good Cookie: Over 250 Delicious Recipes from Simple to Sublime (John Wiley and Sons, 2002, ISBN 978-0471387916), 124. ↑ Edward Schneider, Cooking With Tea; "As for pears, I poached them in Earl Grey, a tea with impeccable prime ministerial credentials." The Washington Post, January 16, 2002. Retrieved February 12, 2013. ↑ 16.0 16.1 Earl Grey Tea Tea 101. Retrieved February 27, 2013. ↑ Beezy Marsh, A cup of Earl Grey to keep the doctor away: Fruit extract can help you lose weight, lower cholesterol and prevent diabetes Daily Mail, March 2, 2012. Retrieved February 27, 2013. ↑ J. Girard, J. Unkovic, J. Delahayes, and C. Lafille, Phototoxicity of Bergamot oil. Comparison between humans and guinea pigs Dermatologica 158(4) (1979):229–243. PMIX 428611 Retrieved February 27, 2013. ↑ K. Kejlova, D. Jirova, H. Bendova, H. Kandarova, Z. Weidenhoffer, H. Kolarova, and M. Liebsch, Phototoxicity of bergamot oil assessed by in vitro techniques in combination with human patch tests Toxicology in Vitro 21(7) (2007):1298–1303. PMID 17669618 Retrieved February 27, 2013. ↑ David G. Bailey, J. Malcolm, O. Arnold, J. David Spence, Grapefruit juice–drug interactions British Journal of Clinical Pharmacology 46(2) (1998):101-110. PMID 9723817 Retrieved February 27, 2013. ↑ Josef Finsterer, Earl Grey tea intoxication Lancet 359(9316) (2002):1484. PMID 11988248 Retrieved February 27, 2013. Tending Toward Tea – an Earl Grey tea review site. Earl Grey descendants sell English tea to China Reuters. My Name Is Earl (Grey) Official Blog of the English Tea Store. History of "Earl Grey tea"
This page was last modified on 26 September 2017, at 15:33.